I think I’m finally starting to lose my double chin. I know this because race photographers continue to think upward angle shots are a good idea. Amateurs. I shouldn’t complain over a free race photo, but then the registration fee was a bit pricey for a little 5K with no road closures. I still can’t get over all the 5Ks around Central Texas. There are over a half dozen each weekend in the Austin metro alone. A baker’s dozen if you expand the radius to New Braunfels and the surrounding hill country. Apparently you can’t have an event without a 5K. I couldn’t find any tenable 10Ks. 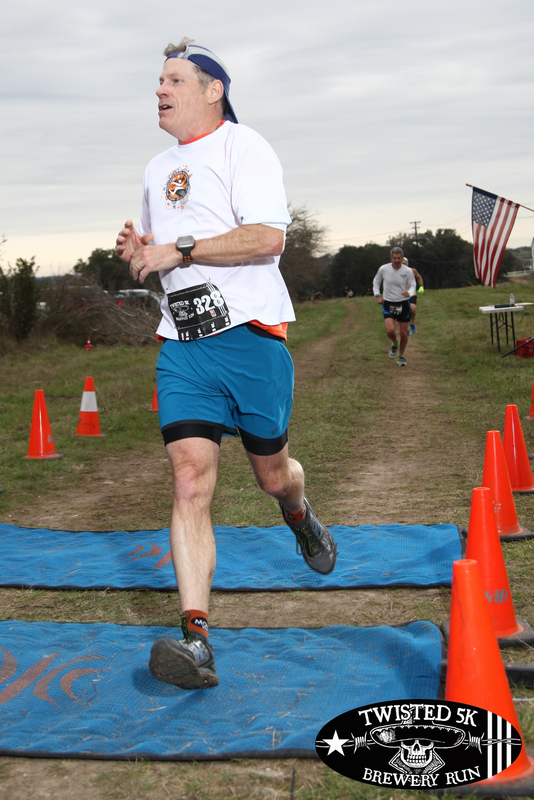 The Twisted X 5K is the only one that provided race photos. I like this one because it shows me finishing ahead of my buddy Ken. He passed me at two miles. 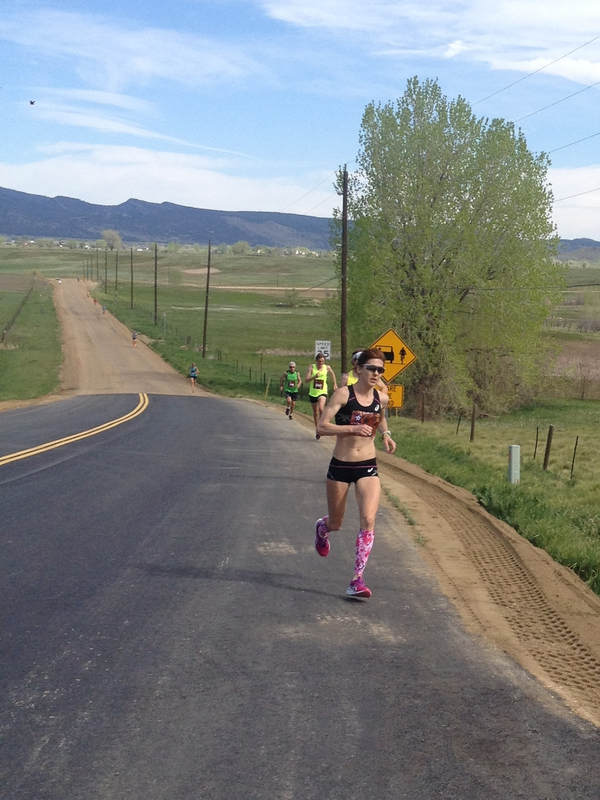 I can assure you that was not part of my race plan, but racing him for the final mile was priceless. I already posted my only photo from the Lakeway Runforapurpose 5K, which I ran a week before the Twisted X 5K. They took awards photos, some of which they posted in the Austin-American Statesman. I’ve been unsuccessful at finding my photo so here is a pic of the runner who beat me, 24 year old Jimmy Ivey. This race posted age graded results, and by that measure, I beat him. But then Ken beat me with his age graded time, in fact he came in first. This race was memorable, if not for being the first time I raced with Ken in 30 years, for the monster hills. My thighs are still sore. The Braunfest 5K took photos of us receiving our medals, but never made them available. 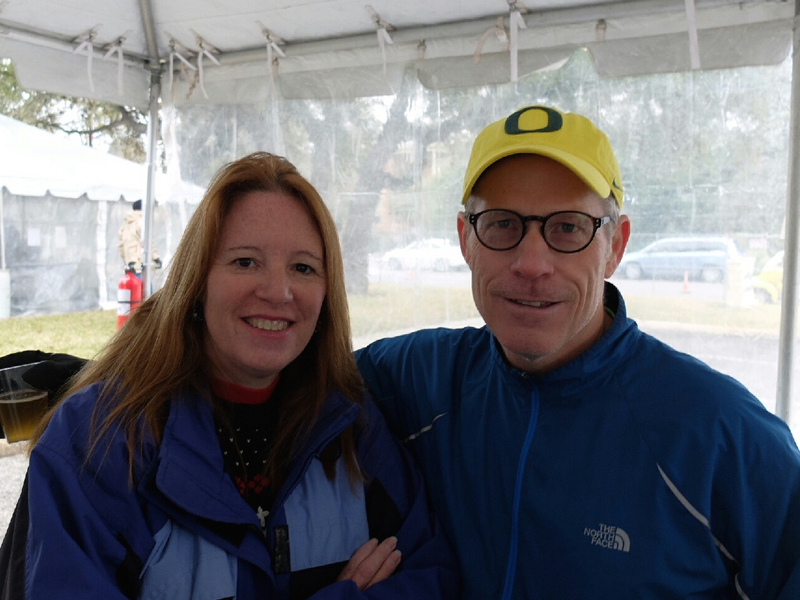 Doesn’t matter, this picture of me standing with Letty in the post run beer tasting tent is better anyway. That was a big beer morning. The most unique thing about that race was that they served chicken wings afterward, with an outstanding selection of hot sauces. With beer of course. Before 9am. New Braunfels is a very German town. 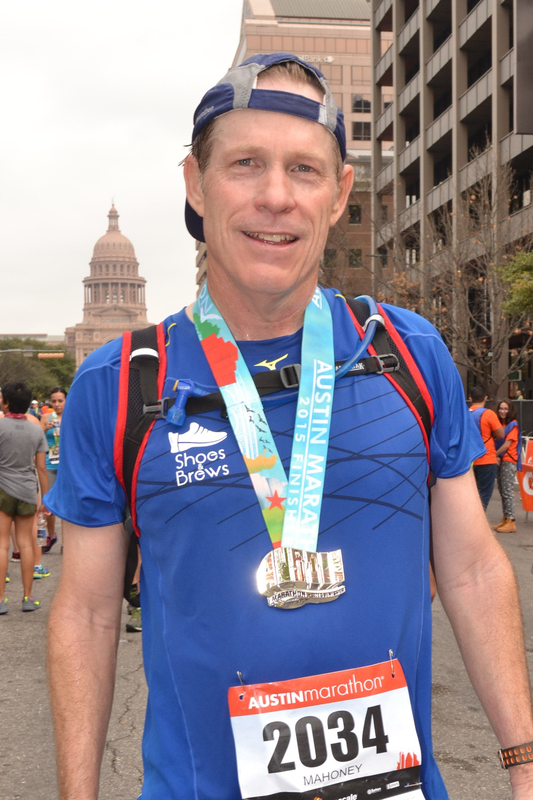 I have tons of photos from the Austin Marathon. This is me, smiling of all things, just after crossing the finish line. I’ve never finished a marathon feeling better. Austin puts on a fun run. I don’t know how many girls along the route yelled at me to “run boy blue!” Not very original after the third time, but consistent enough that I got the message. Next time I’ll try to wear contrasting shorts. The most unique shout out was from a group of girls standing at mile 13; they asked me if I was Kevin Bacon. They were serious. In case you’re young, he’s an aging actor 4 years older than me. I didn’t take it as a compliment, but was surprised by it nonetheless. Maybe he’s also a runner known for wearing monochromatic outfits? I could see Tom Cruise. I mean a much, much older Tom Cruise. 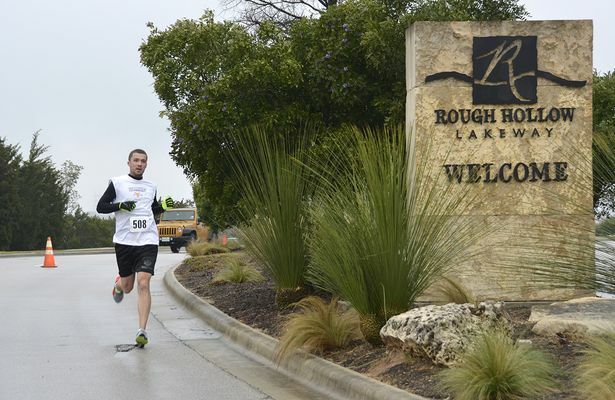 I just received some photos of the Lakeway race today. I attached one to my initial post-race post.